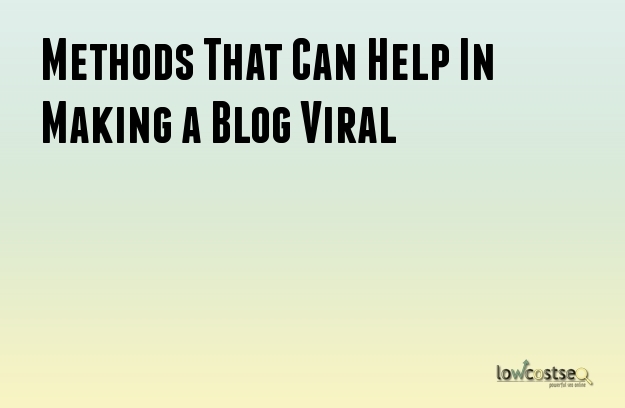 What are the methods in making a Blog Viral? Marketing is the hands and legs of any business. For the success of any business, it is important that you formulate an efficient marketing strategy. This will help in deciding the success of any business. Thus, make sure that you save enough capital and use the right idea for any marketing campaign that you are looking for. There are various marketing tools that you can make use of for the promotion and advertisement of your business, products, and services. However, it is important to keep in mind that every marketing tool has got its own plan and strategy. Neglecting this fact will certainly destroy the entire marketing campaign. So, always do your homework before taking a step forward. The other thing that you must keep in mind is the fact that the traditional form of marketing is certainly way different than an online marketing technique. One of the biggest differences is the costing of advertising and marketing offline and online. Among all the marketing tools that are available blogging is an effective tool that can be used for marketing advertising online. However, there are many who really do not know about the right technique to do effective blogging. So, what is it that you need to pay attention to when planning for blogging? For people to read your blog it is important that you take the initiative to forward your fresh contents or blogs to the e-mail list that you have prepared. Yes, people generally have the habit of opening their e-mail account in order to look for new e-mails. This will certainly increase the chances of your blog being read. This is one of the most effective ways to promote your blog and also make it viral. Thus, always make it a point to make use of e-mail marketing strategy to promote your blogs. One of the most effective ways to promote your blog is by simply posting them on various social media networks. Yes, this is one place where you will certainly find your targeted audience. The best part about social marketing is that you will not only get you targeted audience from within your national territory but also internationally. For letting your blog be viral, it is important that you post your blogs and contents on a regular basis. You will get targeted audience from various age groups. The other great way to get your blogs and contents viral is by simply republishing your contents. By simply republishing them you are actually trying to gather a fresh and new audience for your blogs and contents. This will certainly help you widen your audience base. The other benefit of republishing is that it increases value and provides contents to websites that are admired. For making your post viral, it is certainly important that you not only do the promotion all by yourself. It is very much important that you also take up professional help. You can simply submit your blogs and contents to a content community. It is them you will take the initiative to promote your blog and content.